1987; 324 pages. Genre : Contemproary American Literature. Awards : Pulitzer Prize for Fiction 1988; winner of the NY Times "best work of American fiction in the past 25 years in 2008. Overall Rating : B. This Toni Morrison book is based loosely on the story of Margaret Garner, who unrepentingly killed her 2-year-old daughter with a butcher knife rather than allow her to be forcibly returned to a life of slavery in 1856. 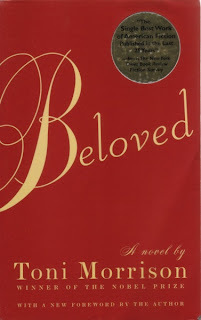 Beloved is set in 1873, after the Civil War has ended, and superficially centers on the mother-daughter relationship between Sethe and Denver, living at 124 Bluestone in Cincinnati, Ohio. The real theme however, is Toni Morrison dealing with the slavery in her geneaology. You can read Wiki's take on Beloved here. For me, the main motif is the way slavery can dehumanize a person. You can set them free, but the years of being treated as merely a piece of property leave enormous psychological scars. To become fully human, with a focused sense of self-worth, may take generations. This is great literature. The characters in Beloved are three-dimensional, and they all evolve in the course of the story. The question of "how can a mother murder her own child" is fully addressed. And there is a ghost to bring a tinge of the paranormal to the story. OTOH, it is a slow read, and a difficult one. Flashbacks and flashforwards interweave with confusing frequency. It helped me to read the Wiki article to sort out who-was-who and what-was-when. The first 60 pages are especially trying, until Beloved shows up. Even then, there is little plot-advancement until the final 50 pages. Finally, there is the typical Morrison bleakness. Mother and murdered-daughter may come to understand each other, but what is left is two utterly dysfunctional lives. What does it take to impress the Pulitzer committee? This is my fourth Pulitzer Prize-winning novel. The other three were The Bridge At San Luis Rey (Thornton Wilder, 1928); The Grapes Of Wrath (John Steinbeck, 1940), and A Confederacy Of Dunces (John Kennedy Toole, 1981). The common thread I see in each book is a unique writing style by the authors. Storylines seem to be of small consequence; what counts is the ability to describe daily life and Americana in a fresh, new way. Beloved is not a book to be read in a hurry, nor would I call it enjoyable. Perseverence is needed to get through the first 60 pages. In the end, I found it to be fully worthy of its Pulitzer Prize. But now I need a "cotton-candy book" to put some sunshine back in my reading. This book sounds better than The Bluest Eye, but still too rough for me. I don't think I could handle Toni Morrison. ah, but you've read Nabokov! after Russian lit, isn't everything else (except maybe for Milton) child's play? Nabokov isn't like traditional Russian lit, though. I haven't yet liked any of the Russian things I've read, beyond Nabokov. Anna Karenina, Dr. Zhivago...I'm not sure but there's probably more than that. i'm going to try several other russian authors this year. The Russian authors though aren't rough and gritty. Depressing, sure - I can handle depressing - but I can't handle violent, raw, graphic, etc. I think I loved Beloved most the first time because it *was* so hard to read. I was reading YA and other "cotton candy" literature, as you put it, and then I read this -- probably age 14 or 15 -- and was blown away by how powerful it was for me. I agree that it's not necessarily enjoyable, but when I first read it, I was taken by the surreal and the themes and considered it my favorite book for years. I haven't reread it for a few years now, so I guess I need to return to it and see what I think, 15 years later. This comment isn't really about Beloved, but I just wanted to state I don't think all YA books are cotton candy. I think there are some very strong YA books out there, as strong as - if not stronger than - adult books. Especially modern books. Amanda, after I pressed "post" and reread my comment, I thought "oops, I said that wrong; Amanda is going to say YA isn't all cotton-candy". What I meant was I was reading "cotton-candy" YA and that was about it. Reading Beloved showed me that reading could be hard and still be enjoyable (although that is the wrong word for this particular book). I don't normally read YA now, but I'm sure there is some very well developed YA out there. That's hillarious! I agree, there is a lot of cotton candy YA out there, in fact, I stopped reading for a long time because that's all the YA I could find when I was younger. Sweet Valley High and all that stuff. It drove me nuts. I figured all books were like that. But YA has changed a lot since that time, and there are a lot more meaningful books out there. There's a lot of cotton candy adult books, too, and I avoid those. Beloved is on my list for this year. I have started it and I'm past the part where Beloved shows up. So far it is wonderful, but I have had to read some other things in the mean time. (Harry Potter.) There are some tough scenes I haven't gotten my head around yet. I think when I go back to read it again, it will help reading this review and also checking out the wiki article. I also have A Mercy on my list for this year, and I believe that one is supposed to be Toni Morrison's retake of the original story from Beloved, how she would have done it if she had it to do over.